We returned home last week and I have a need to write my comments without delay to let people know that we had a fantastic time in Russia despite the cold weather and that we greatly appreciate everything Vodohod staffs did to ensure that everything was organized to perfection. Since we took several ocean cruises before, we were therefore not easy clients, but the company responded to all our queries and requests with speed, friendliness and efficiency. Our trip was wonderful and we continue to talk about our experiences often. We were very pleased with all aspects of the trip and enjoyed the boat very much such as Russian music, Russian lesson, dance and songs. We particularly enjoyed our tour guides- Katia & Gregory - they were all excellent. Our local drivers were also very good. The tour guide, Katia was knowledgeable and efficient and a lovely young person. The bad and cold weather contributed greatly to our overall excursion. I know the cruise staffs couldn&apos;t arrange the weather, but they arranged everything else and for that we thank them most warmly. We like to extend our appreciation to all local tour guides in Moscow, Uglich, Goritsy, Yaroslavl, Kizhi, Mandrogui to Saint Petersburg who were excellent, some were enthusiastic and knowledgeable. They were very knowledgeable and professional. In addition they were engaging and willing to answer all of our questions. We enjoyed them all and found them very pleasant to travel with. 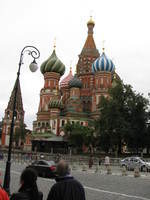 We have traveled a great deal and had many guides over the years and found each of our guides on our trip to Russia were top quality. Despite the last day in Saint-Petersburg with light rain, they gave us an exciting day driving round Saint Petersburg and out to Pushkin and Pavlos for Catherine and Paul Palaces. The food served in the boat was excellent and different every time. The best plates for us were soups, salad, fish and chicken. We knew that beef and lamp might not be the best Russian plates. In the dinning room we like most was the crew dressed up differently almost every night which made the ambiance more cozy and exotic. Please extend our gratitude to Karina who had always smiled when serving us. It was a trip to remember and it was possible because our bus driver and local guide were so good and the Russian scenery was colorful, amazing and very exotic. We would agree to give four star ratings to the Vodohod organization, crew member, bus driver and tour guide, the places visited. However the accommodation was small and the shower was not very convenient for North American customers. Just a note to say thank Vodohod organization for the fantastic river cruise in September from Moscow to St Petersburg. We had an amazing time - enjoyed every minute of our trip. We are recommending the trip to all of our friends in Canada - they have our full endorsement! We will definitely contact Vodohod if we are planning another trip in near future.